Every day the kids come home from school hungry. Until a couple of weeks ago, I picked a snack just before they got home, or even just after. But two weeks ago I decided to create a formal, written snack schedule. I came up with some ideas, printed a weekly calendar and asked the kids to join me for a meeting to discuss the selections. What I hadn’t expected was just how excited they would be about the whole thing. I knew that they were accustomed to snack schedules from their days in daycare and after-school care, but I didn’t realize how well they would respond to the idea of doing it at home. The kids decided they also wanted fruit smoothies on Tuesdays, which is fine with me, because I always sneak in some protein powder and/or flax oil. Other than that, they didn’t have any immediate changes. Once Thursday came, my daughter vetoed the ginger tea, though. These are pretty much the same snacks they always had, but you would think they are brand new from their reactions. Writer Katrina Kenison believes that we all need to find some rhythm in our lives. In order to do so, she says, we “must commit ourselves to order and routine; to a slower, more deliberate pace; to intention rather than to happenstance. In other words, we must develop a sense of ritual.” She adds, “When we begin to celebrate life moment to moment, we show our children that their own lives are worthy of observance and celebration… Children find contentment and strength not in the day’s array of activities, but in consistency, and in the familiar, homely routines that give each day its shape.” In addition to creating a snack schedule, we created a school lunch schedule, a selection of dinner ideas, a grocery list for all of the above and a list of daily homework commitments. For Wednesday’s snack of hot chocolate and pretzels, I turned to my favourite vegan hot cocoa recipe, which I modified from Raising Vegetarian Children : A Guide to Good Health and Family Harmony by Joanne Stepaniak and Vesanto Melina. It's a simple blend of water, non-dairy milk, cocoa and organic sugar. I also like to add some cinnamon. It gives the hot chocolate a subtle complexity. It's not an overwhelming cinnamon flavour, it just enhances the richness of the cocoa. We also like to add vegan marshmallows from Dandies as a fun topper too. 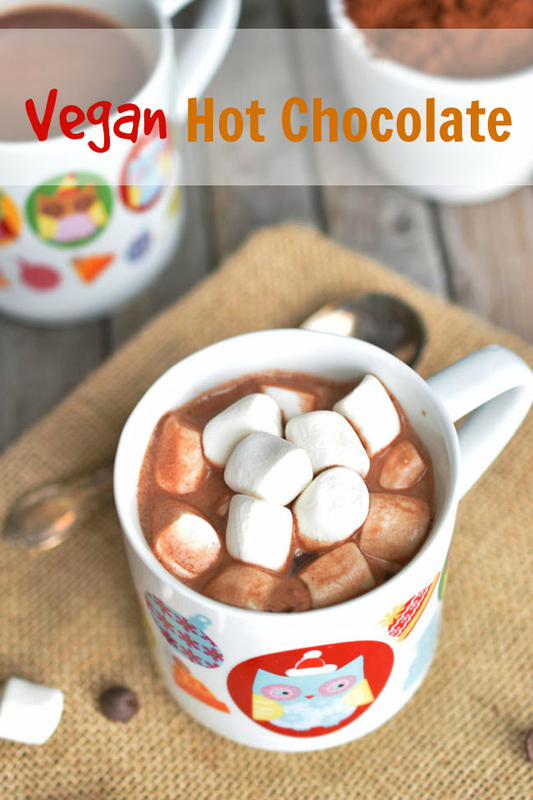 This hot chocolate is not entirely healthy (aka not sugar-free), but it's much better and more natural than the store-bought "candy cane" hot chocolate that my kids like. And you can certainly use less sugar to suit your tastes too! What's on your snack list? Combine the cocoa, sugar and water in a small pot and warm over medium heat. Bring to a boil for one minute. Lower heat to medium-low and add cinnamon and non-dairy milk. Warm through, stirring often. Remove from heat. 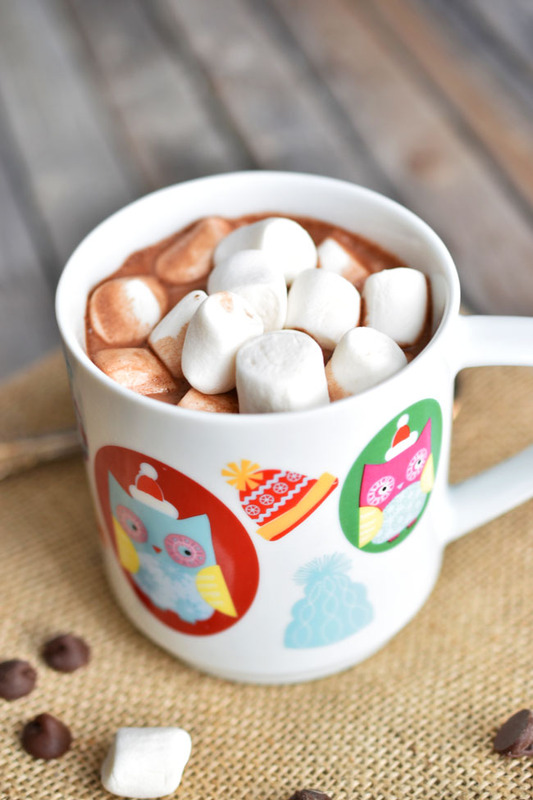 Pour into two mugs and top with marshmallows. Enjoy! Perfect way to use those illustrious marshmallows! For some reason, I've been having a hard time getting them in my area too... But that won't stop me from drooling over that photo. Just can't beat hot cocoa with melty marshmallows on top! It's quite a treat for me, too. I hadn't had marshmallows for years until we found these ones.